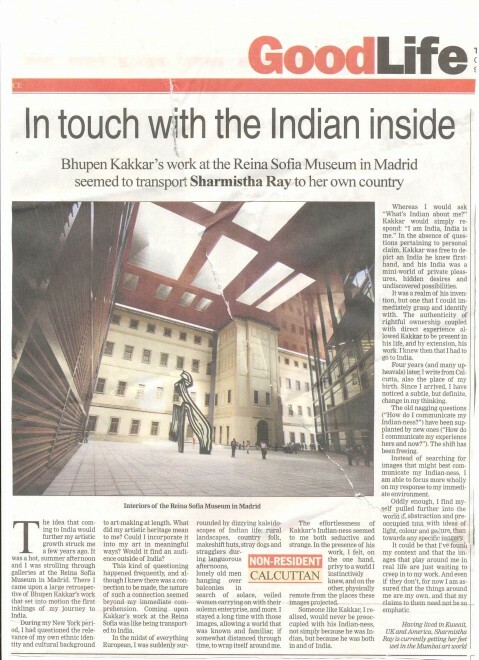 Bhupen Kakkar’s work at the Reina Sofia Museum in Madrid seemed to transport Sharmistha Ray to her own country. The idea that coming to India would further my artistic growth struck me a few years ago. It was a hot, summer afternoon and I was strolling through galleries at the Reina Sofia Museum in Madrid. There I came upon a large retrospective of Bhupen Kakkar’s work that set into motion the first inklings of my journey to India. During my New York period, I had questioned the relevance of my own ethnic identity and cultural background to art-making at length. What did my artistic heritage mean to me? Could I incorporate it into my art in meaningful ways? Would it find an audience outside of India? This kind of questioning happened frequently, and although I knew there was a connection to be made, the nature of such a connection seemed beyond my immediate comprehension. Coming upon Kakkar’s work at the Reina Sofia was like being transported to India. In the midst of everything European, I was suddenly surrounded by dizzying kaleidoscopes of Indian life: rural landscapes, country folk, makeshift huts, stray dogs and stragglers during languorous afternoons, lonely old men hanging over balconies in search of solace, veiled women carrying on with their solemn enterprise, and more. I stayed a long time with those images, allowing a world that was known and familiar, if somewhat distanced through time, to wrap itself around me. The effortlessness of Kakkar’s Indian-ness seemed to me both seductive and strange. In the presence of his work, I felt, on the one hand, privy to a world I instinctively knew, and on the other, physically remote from the places these images projected. Someone like Kakkar, I realised, would never be preoccupied with his Indian-ness, not simply because he was Indian, but because he was both in and of India. Whereas I would ask “What’s Indian about me?” Kakkar would simply respond: “I am India, India is me.” In the absence of questions pertaining to personal claim, Kakkar was free to depict an India he knew first-hand, and his India was a mini-world of private pleasures, hidden desires and undiscovered possibilities. It was a realm of his invention, but one that I could immediately grasp and identify with. The authenticity of rightful ownership coupled with direct experience allowed Kakkar to be present in his life, and by extension, his work. I knew then that I had to go to India. Four years (and many upheavals) later, I write from Calcutta, also the place of my birth. Since I arrived, I have noticed a subtle, but definite, change in my thinking. The old nagging questions (“How do I communicate my Indian-ness?”) have been supplanted by new ones (“How do I communicate my experience here and now?”). The shift has been freeing. Instead of searching for images that might best communicate my Indian-ness, I am able to focus more wholly on my response to my immediate environment. Oddly enough, I find myself pulled further into the world of abstraction and preoccupied thus with ideas of light, colour and gesture, than towards any specific imagery. It could be that I’ve found my context and that the images that play around me in real life are just waiting to creep in to my work. And even if they don’t, for now I am assured that the things around me are my own, and that my claims to them need not be so emphatic. Having lived in Kuwait, UK and America, Sharmistha Ray is currently getting her feet wet in the Mumbai art world.